This was an amazing week. On Wednesday the Rosetta spacecraft launched the tiny Philae lander on a 10km journey to the surface of a comet: a mountain-sized rock, millions of miles from Earth. This was a first that touched many around the world, millions of whom who followed the event online. It took ten years to get Rosetta into a position where this was possible, with teams of people working to make it happen in Europe and around the world. On Friday my nephew Taliesin, who has Cerebral Palsy, walked 1km to school for the first time in his life. 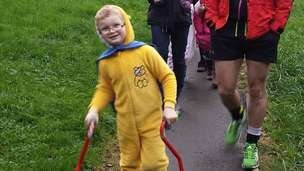 He did it for Children in Need – you can still donate! No wheelchair, just his walking sticks. This was also a first that touched many around the world, hundreds of whom followed the event online. It has been three years since Tal had an operation (SDR) to improve his condition, one that ultimately made this walk possible, with a team of fundraisers at home and a medical team in St. Louis; not to mention his tireless parents. Tal and Philae both had their mountains to conquer but, for me at least, one of these story’s is more incredible than the other. So here’s my favourite image from the past few days – and it’s entirely Earthbound. Sadly, Philae has powered down, and its mission may have come to an end. For Tal though, things continue to improve. Tal is an inspiration to so many, and I’m incredibly proud of him and his family for going the distance this week, and for the past few years. Hopefully I’ll report on both these stories in the future. Meanwhile you can read Tal’s story on the BBC. You can support kids like Tal, and their families, by checking out SDR Wales, or supporting organisations like Bobath Wales.